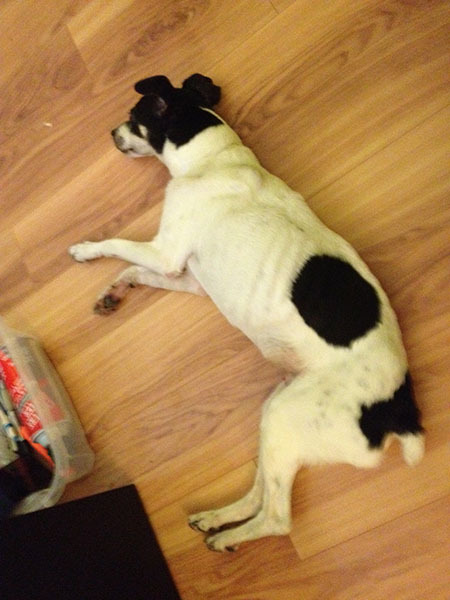 We’re hanging in there with Skipper, our rescued rat terrier that moved in with us last week, and learning to deal with his health challenges. He’s still sleeping in our backyard since he needs to pee so much with canine diabetes, but the barking issue is getting better. We’ve been spending more time with him during the day giving him lots of attention and wearing him out so he’ll be ready for a peaceful night’s sleep. 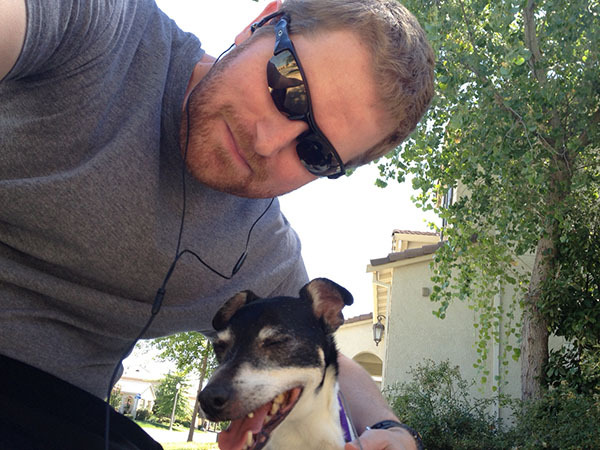 Hubby has been taking him for a lot of walks and even for a 1/2 mile run. Poor guy crashed on the cool floors after. I felt bad that he barely fits in the chihuahua-sized beds we have and picked him up a larger bed he can stretch out in. But Miko keeps hogging it. While Skipper prefers the cool floors now since the poor guy is always panting. He got his first insulin shot today which is a new experience for us and it will be interesting keeping up with it two times a day, but we decided it was worth it to make him comfortable for however much time he has. But it’s too early to tell how much it’s helping with his constant thirst and hunger, I’ll be posting more Skipper progress reports. He also loves V-Dog dog food scarfing down a huge bowl of it for dinner. 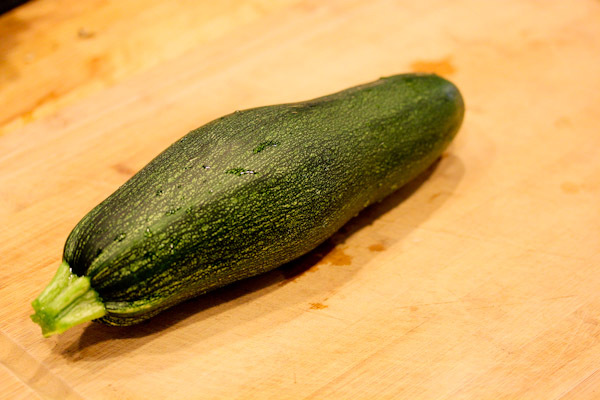 I still have not made it to the market and raided our garden again for this pregnant looking zucchini for dinner. A Thai fried rice recipe I saw awhile back inspired this sauce. I couldn’t tell you how close the sauce resembles the recipe since the original was not vegan friendly, but the sauce is very tasty with a nice level of spicy flare and range from the cinnamon, fennel seed, and garlic. Place all ingredients into a blender and blend to a smooth and creamy texture. 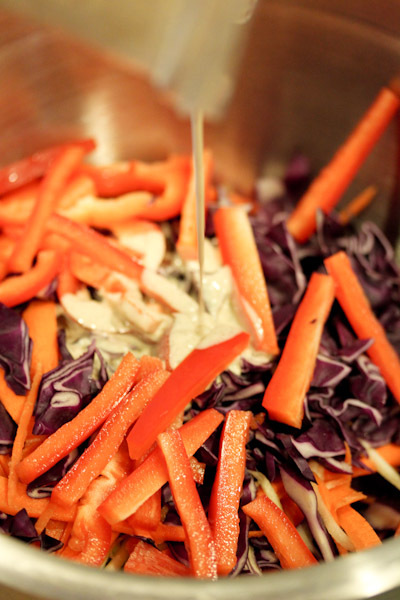 Serve as a salad dressing or sauce for spiral sliced veggies. Makes 2-4 servings. 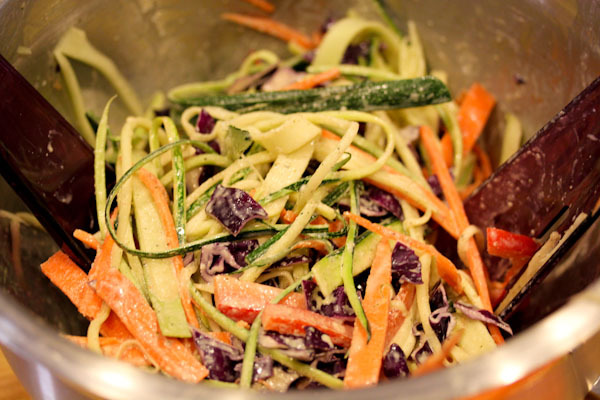 I coated a simple veggie noodle dish of julienne-sliced zucchini, carrots, sliced red bell pepper, and cabbage in the sauce. 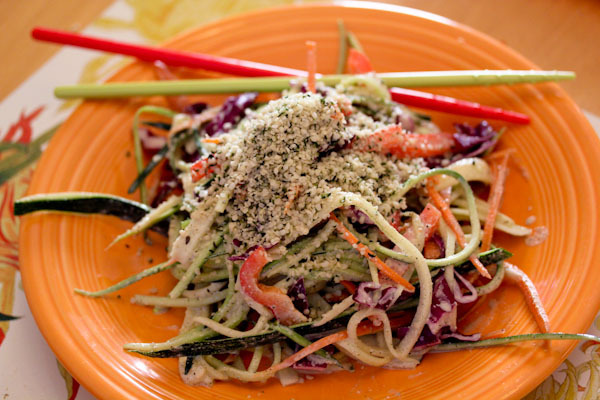 And served topped with more hemp seeds for a fresh and cool dinner, perfect for the August heat here. The sauce is delicious and packs a lot of kicky flavor, a little goes a long way and is great for adding flare to milder veggies. 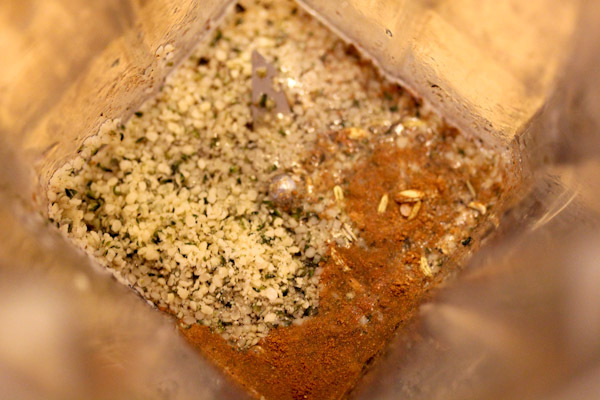 The cinnamon and fennel seed add a saucy flavor combo that’s unique and warm and soothing. Skipper has been in my thoughts! As have you and your family! Bless you for taking him in! It looks like he is very comfortable and happy. 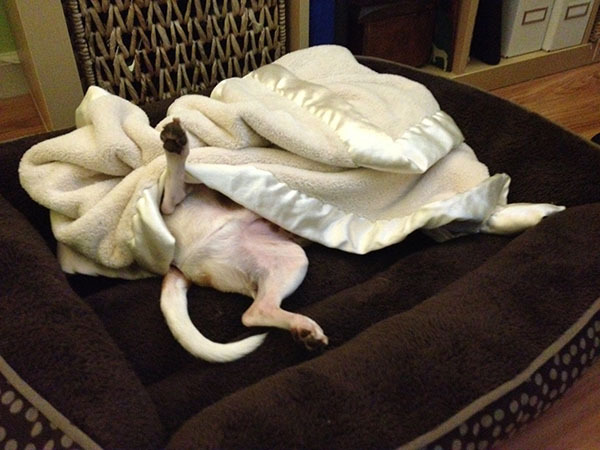 The photo of Miko ‘hogging’ the bed cracked me up! Thanks, appreciate that. :-) Skipper is doing good, we’re wondering if we need to reduce the insulin dosage a bit since he’s still so skinny. Thanks! 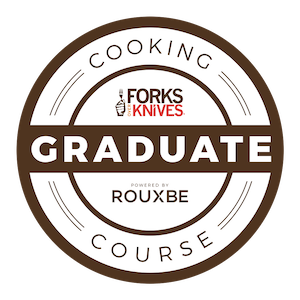 :-) It’s been an interesting and fun adventure.